This past week started with a bang, then promptly face-planted. 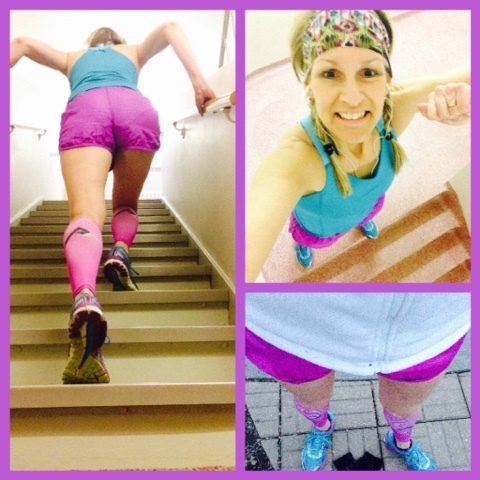 As promised in my previous Weekly Wrap (the link is HERE ), I wanted to do a brick workout involving running/stair-climbing/running....and I finally got it done on Monday. The temps were mild, so I suited up in shorts, tank, and jacket and hit the streets. The commute to my downtown building is eight city blocks (a little less than a mile). It was just enough to get the heart pumping and my legs warmed up. I wasn't sure how many sets of stairs I wanted to climb. I had done 16 sets (80 total flights) two weeks prior and that felt like too much (but it was my first official major training session). I also had done 12 sets (60 flights) the previous and that had gone better. I really wanted to do 20 sets (which would be 100 flights), but I didn't think it would be smart to have that dramatic of a jump in flights (and I still had to run back home when finished). The first five sets went well, and seemed pretty easy, which is a sign that my body is already acclimating to the intensity of climbing five flights at a time (and also walking back down those five flights then doing them all over again). I wound up doing a total of 14 sets, which gave me 70 total flights. I climbed all of them "by two's" and ran the first five sets pretty fast. My event (Fight for Air Climb) isn't until April 10th, so I have plenty of time. There's no need to conquer 100 flights yet, besides the actual event has us "only" climbing 86 flights (divided among four different buildings). If there's one thing I detest, it's over-training, no matter what sport. 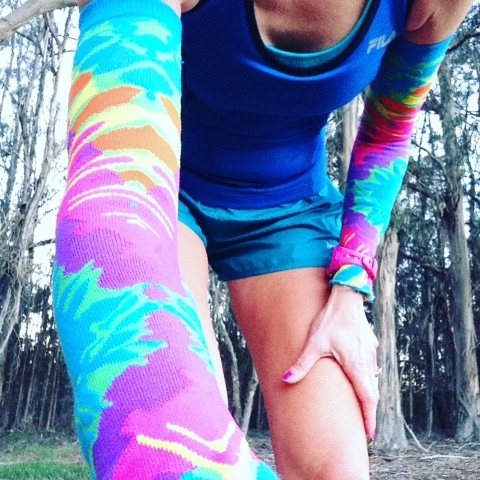 Over-training is an invitation to injury, and I avoid it like the plague. 70 flights of climbing and returning back home. Brick complete! Anyways, I went to bed feeling great but woke up Tuesday morning feeling like I got hit by a bus. Achy body, runny nose, and my first-ever sinus headache. Ugh. I did some arm/shoulder work (free weights) in the evening, and called it good. Wednesday was not any better. I was due for a short run, but elected to stay inside, hoping the last of the ickiness would be gone by morning. No such luck. Although Thursday was better, the achiness still lingered. I've talked before about my "never miss a Monday" habit. 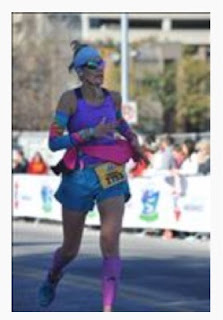 I successfully ran at least one mile every Monday in 2015, except for two Mondays when I was (1)in severe pain from falling and bruising several ribs and (2)when the Plantar Fasciitis paid me a visit and I could barely stand. 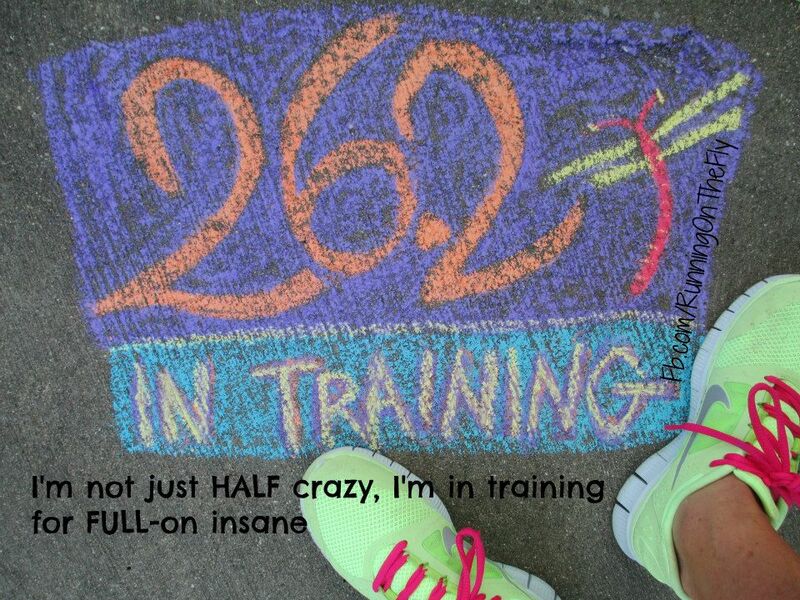 Another habit I have successfully maintained is to never go more than two days without running. I had already missed Tuesday and Wednesday, so Thursday was on deck for some action in my Brooks Adrenalines. Except I had to work all day, and we had plans to go the high school basketball game (sub-state playoffs), and the weather was cold and windy (again). We got home around 10:00 from the game, and I decided to attempt a quick mile on the treadmill. Much to my surprise, the mile actually felt good (though a bit slow and sluggish). I set the speed on 6.2 (usually an easy pace), and although I could keep up with it, it certainly challenged my achy body. Friday was a similar day - not much for physical activity or energy, and another long day "at the office." Ugh. Saturday, as forecasted, arrived with pleasant temps (in the low 50's) and lots of bright sunshine. I was feeling better, but still more "under" the weather than over it. 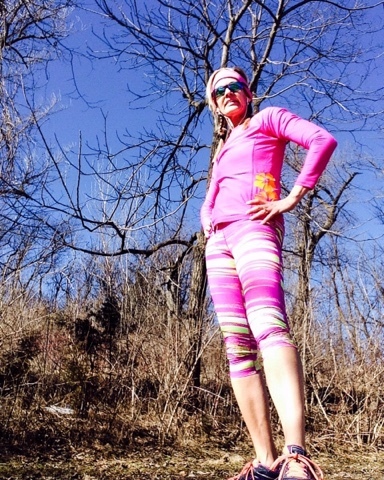 I set out to conquer seven miles. 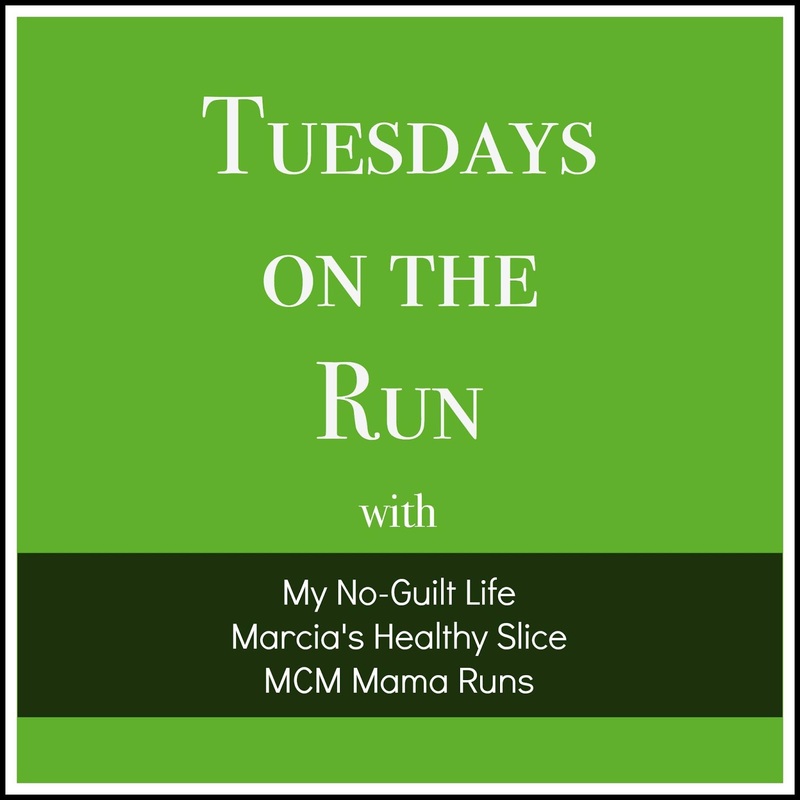 I had a 2-mile route to the lake, a lap around the lake (one mile), and back would give me five miles, and I planned to do a 2-mile loop around the college campus and nearby neighborhood. Already within the first mile, I knew my 7-mile plan might need tweaking. 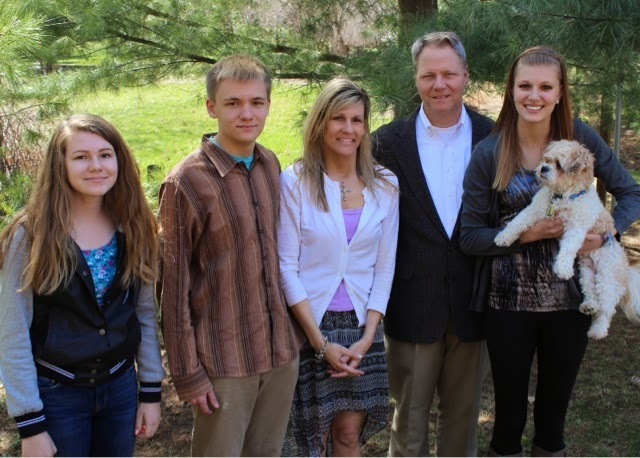 My entire body still felt achy and stiff, and with all the lingering sinus gunk (lodged in the back of my throat), every breath of air was a struggle. My pace felt alright, but it certainly took more effort than usual. 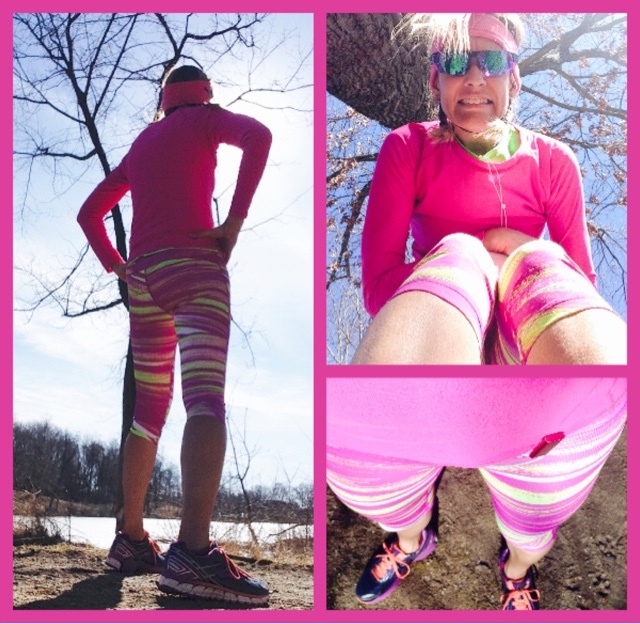 I made it to the lake, ran the loop, and had to shed my top layer for the trek back home. I had not brought any tissues, and am not a snot-rocket-blower, so my head felt like it was about to explode. I elected to take a pass on the extra two miles, and called it good at five. 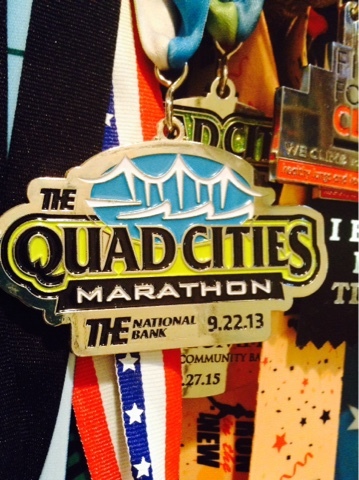 I didn't have any injury-related discomfort, but my body was not at 100%. It was exhausting trying to make it do what it just was not up to doing. I could hear every clod-hopping thud of my feet over my music (AC/DC, none-the-less), and I knew my form was compromised from my state of fatigue. There is nothing to gain from over-doing it. My ego did not need stroking, and my body was (still) craving rest. Sunday morning had similar temps, so I decided to head out and try to do a couple quick miles in the sunshine before church. Again, my head was still a gunked-up mess and my body was not as willing to move as fast as my mind was hoping it would. Humbled again. But alas, I know this is a temporary condition, and I know it will pass. Fortunately, my current state of less-than-desired-optimal health didn't stop me from enjoying the fresh air and beautiful sun! On a much brighter note, I discovered a pleasant surprise in our sun room. 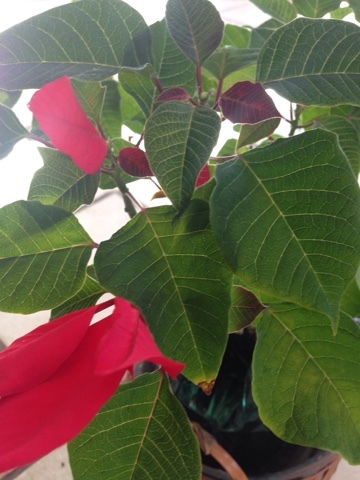 A pointsettia (from Christmas 2014) is showing signs of coming back to life! The vibrant red leaves certainly made me smile after the downer of a week I'd just endured. So, what did this week teach me? To persevere, but to also ease up when my body is not at 100% optimal health. I can't help but wonder if the extended number of days spent inside played a part in this stubborn cold lasting so long....I'm usually outside a lot more and typically don't have colds of this magnitude take over my life. Things could be so much worse, though, so my pity party was nothing to celebrate. 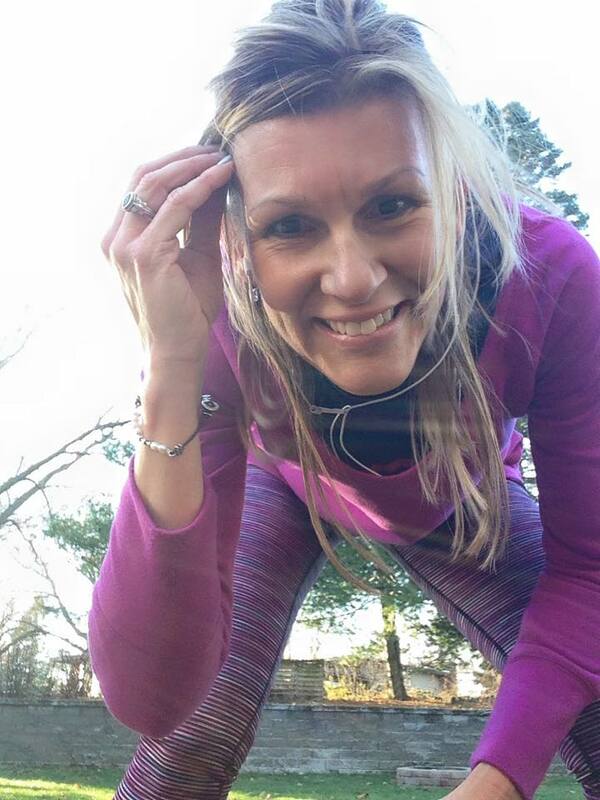 And, again, I was reminded to be thankful for the simple ability to run, even if my body has to take it slow. 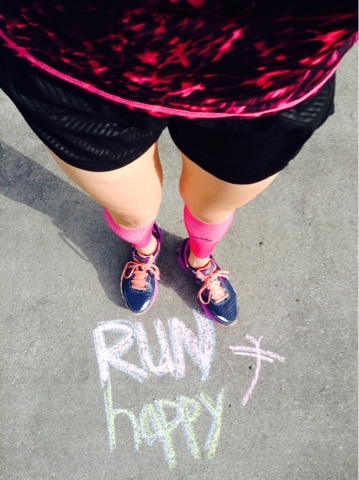 I choose to run happy! What do you do when your health is compromised...grit it out (and risk injury) or ease up (and feel guilty)? I'm linking up with the lovely Holly (from HoHo Runs ) and Tricia (from MissSippiPiddlin ) for the Weekly Wrap. 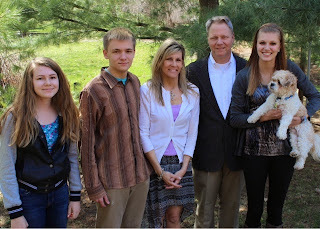 Do head over to the link-up and check out what everyone's been up to!! How about a re-introduction of sorts? ...maybe with some of my favorite #hashtags? 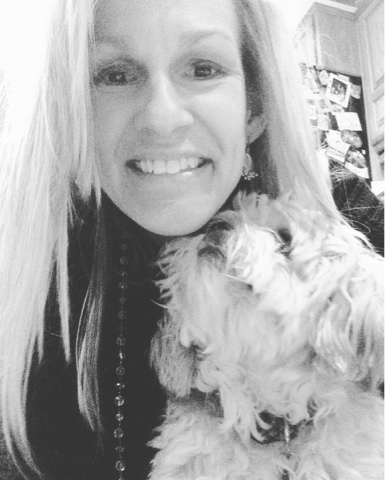 I've been participating in a fabulous blog hop (hosted by Kristy at Runaway Bridal Planner ), and today is my day to shine (so to speak). I'll spare you a lengthy monologue about all of my likes, traits and quirks. Instead, I'll give you some of the basics, and highlight some previous blog posts (via links) that will give you more of the nitty-gritty details of what I'm all about. ***I'm an #Iowarunner (Shocker, I know). Care to know more? Here's the blog post that best says it all.... (Almost) all about me (It's really hard to re-write my story any better than the first version). 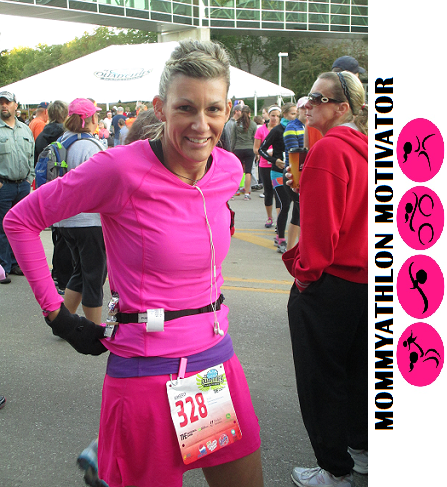 ***I'm a #marathoner, actually a 3-time marathoner. 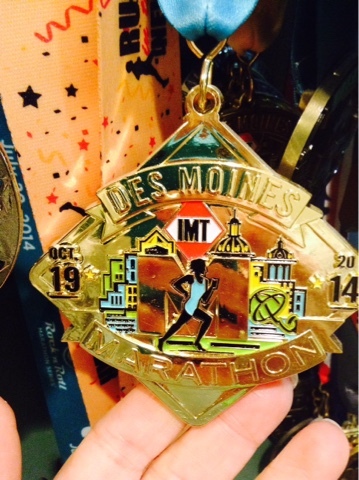 My three marathons thus far have been the Quad Cities Marathon in 2013 (recap HERE ), the IMT Des Moines Marathon in 2014 (recap HERE ), and Grandma's Marathon in 2015 (recap HERE ). 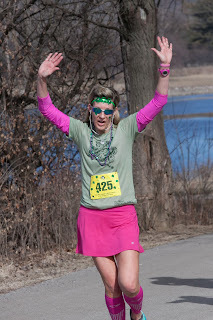 I have also done several half marathons (26), a few 10-milers, and too many 5K's to count. Yep, single digit temps on race day.....bring it! ***I'm also an obvious #colorfreak. I love color and I'm not afraid to wear it. One of my mantras is #GoBrightOrGoHome. 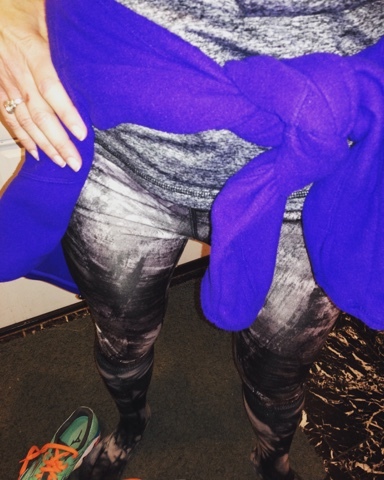 ***I have been known to geek out on #accessories (and not just in my running clothes). This is Max, our family's first dog. We adopted him from a nearby shelter a year ago. I think he loves me as much as I love him. 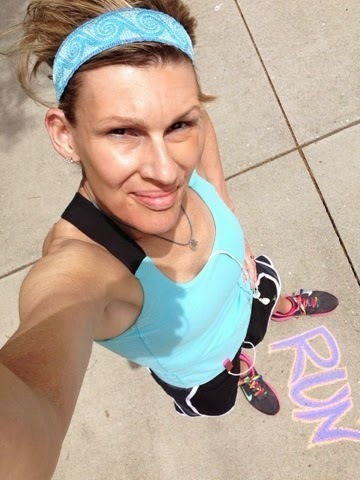 ***I'm #notjustarunner. I also do yoga (occasionally), and am a firm believer in cross-training. ***And I love #stairracing! I have done the Fight for Air Climb four times (three times in Des Moines and once in Chicago)...and will be taking it to the stairs again in April (in Des Moines). 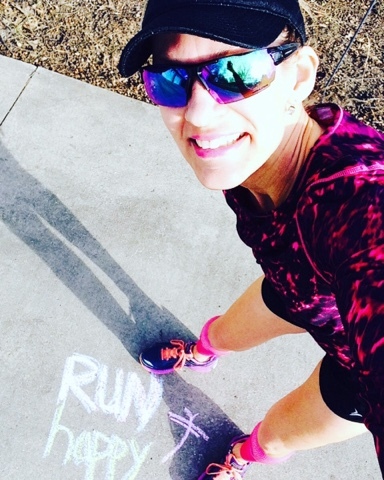 You can also find me on Facebook (Running on the Fly ) or Instagram ( runningonthefly ) Stop by and say, "Hello!" I have a lot of favorite medals in my collection. I'm not even sure of my total count (70? ), but there are some beauties hanging on that refurbished coffee mug peg rack. There's a lot of miles behind the medals, and a lot of blood, sweat and tears as well. ....or from my first-ever distance race, Dam to Dam in 2008 (recap HERE). This race has so much sentimental value to me, I have gone gone back and run it every year since that first race in 2008. 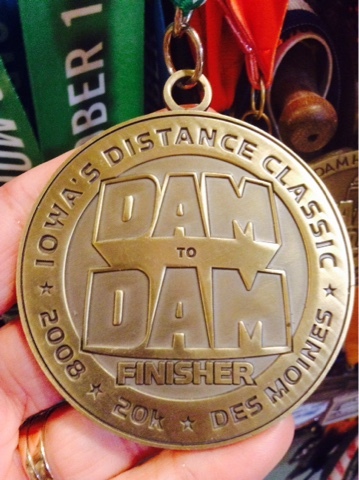 I'll be running my 9th Dam race in June and am just as excited as I was nine years ago. 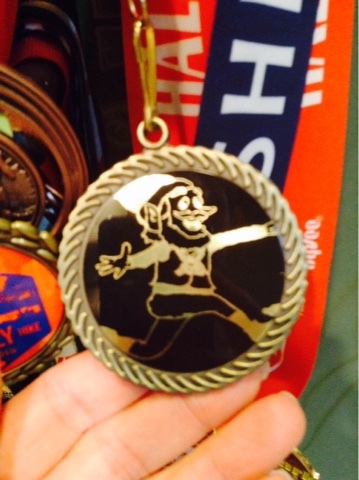 My first-ever distance race was Dam to Dam, it was a 20K back then (now it's a half marathon). I crossed the finish line and knew it wouldn't be the last time. ...and some are from a significant accomplishment, like a 6-hour endurance ultra. 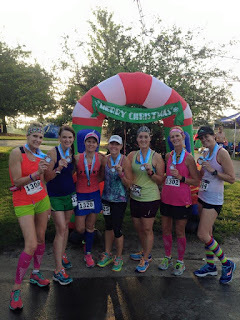 The Christmas in July (recap HERE ) event began at midnight, and we not only had significant heat and humidity, but also lightning and a couple of hours of rain. 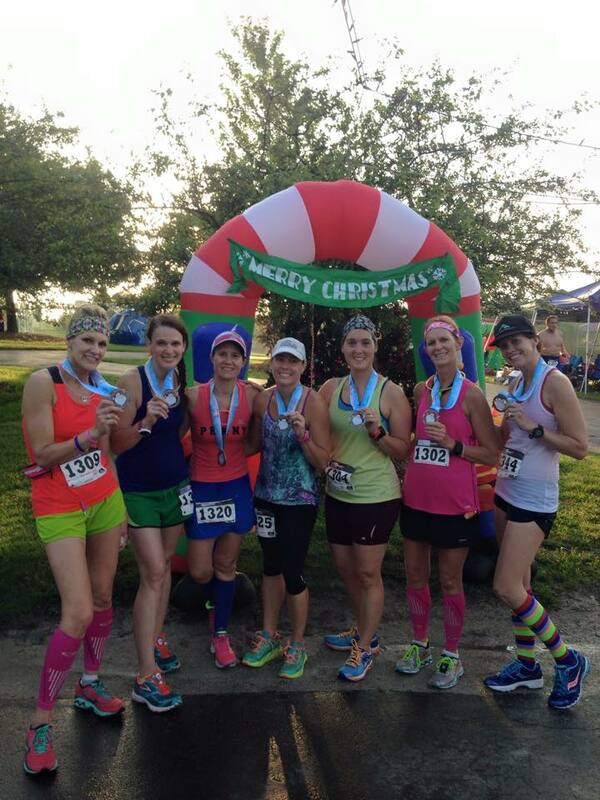 But I also had six fellow runner gal pals there with me, and we persevered and finished (and we all vowed to return in 2016 and take on the 12-hour event instead!). 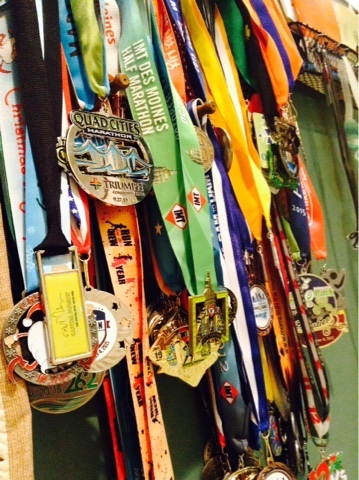 Some medals represent much more than just a finish line. 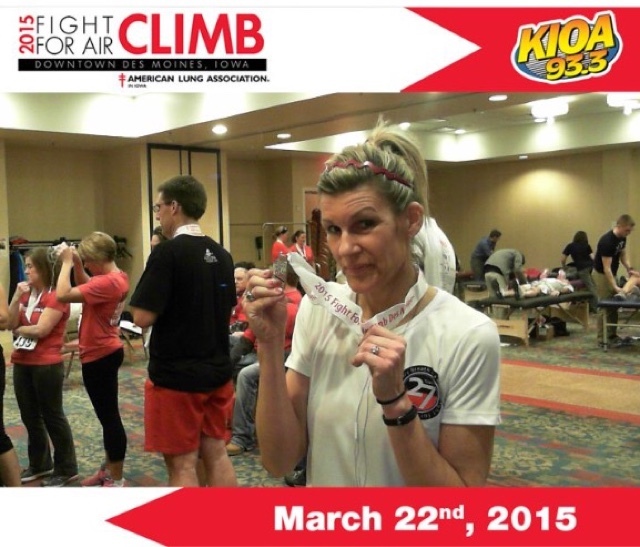 I have done the Fight for Air Climb four times, three times in Des Moines and once in Chicago. Let me tell you, I definitely was fighting for air in Chicago (recap HERE ). That venue had us climbing the four Presidential Towers, for a total of 180 flights of stairs, raising funds to support the American Lung Association. 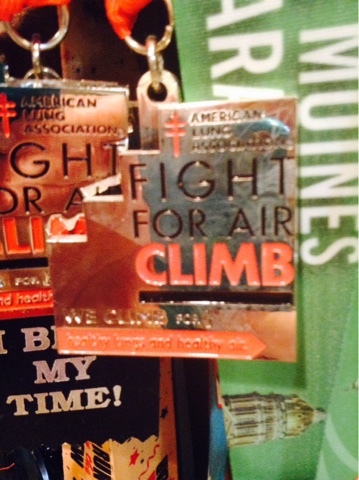 I have four of these babies from the Fight for Air Climb...this one is from the 2014 Chicago venue...180 flights of climbing! 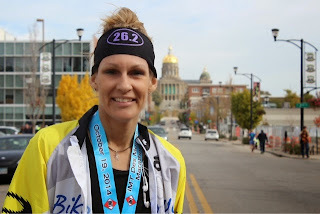 Some are from placing in my age group.Having spent most of my life as an athlete-wannabe, running finally gave me a glimpse of setting goals, training, and finish lines. Being awarded a first place medal was a pretty cool moment! Jingle Jog 2010...my first-ever Age Group award, and I got 1st place! 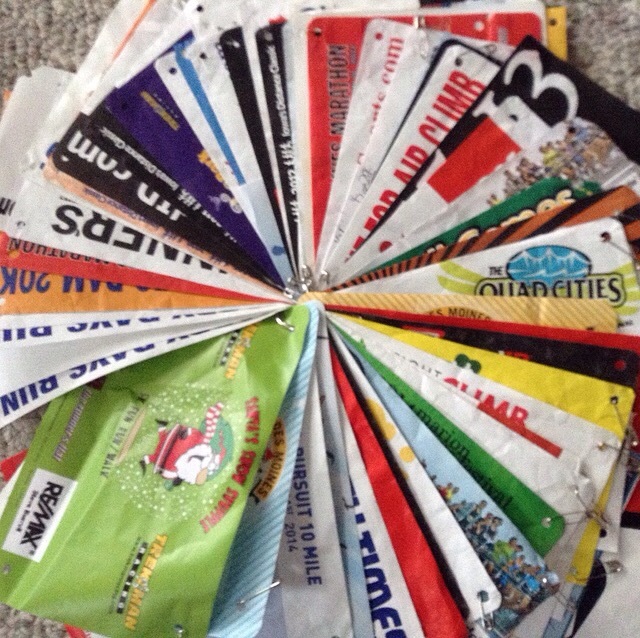 A lot of them are finisher medals. And some are just absolutely beautiful. 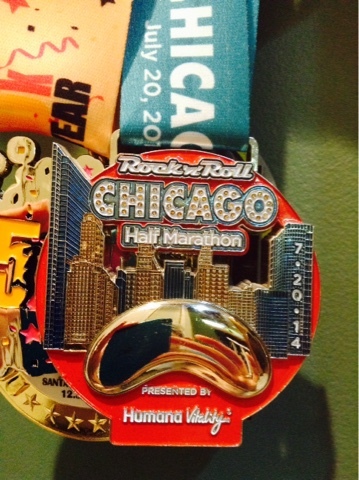 Rock'n Roll Chicago Half Marathon....it's got the Bean and the skyline, what's not to love about it? 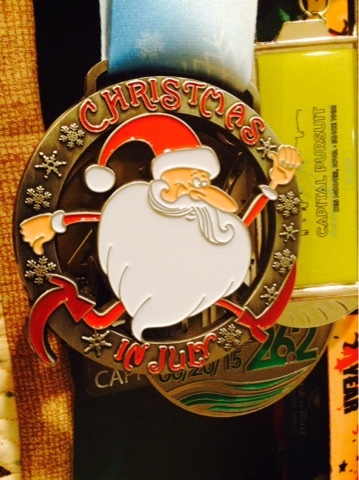 Do you have a favorite medal from an event? Have you ever gone back and done the same event more than once? 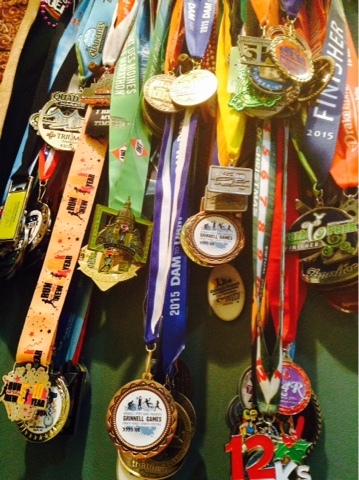 Do you keep your medals displayed? Have you any medals like the ones featured above? 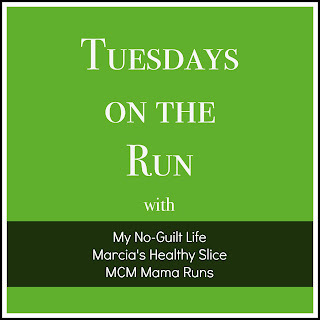 I'm linking up with Marcia's Healthly Slice , MCM Mama Runs , and My No-Guilt Life for Tuesdays on the Run, and we're talking Medals today. Head over and get some inspiration! So, yeah. Another week is in the wraps. If I had to pick a theme for this past week, it would have to be consistency. 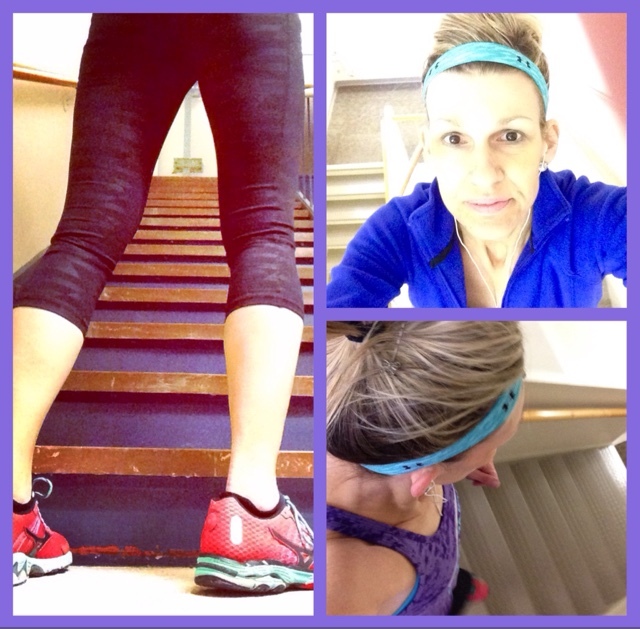 The week started off with a trip to the downtown office building for some stair-training on Monday after work. 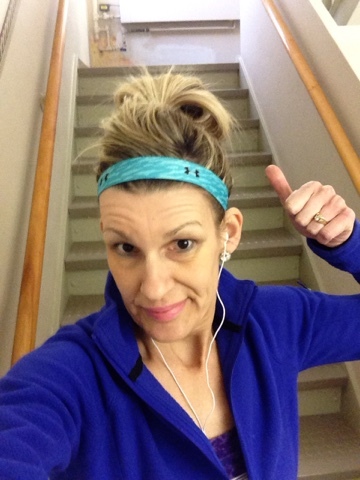 I have wanted to make this a brick workout (of sorts)....run (literally) from my house to the building, do my stair routine, and then run back home. So far, I'm 0-for-2 on that endeavor. Stay tuned....I promise it will happen. 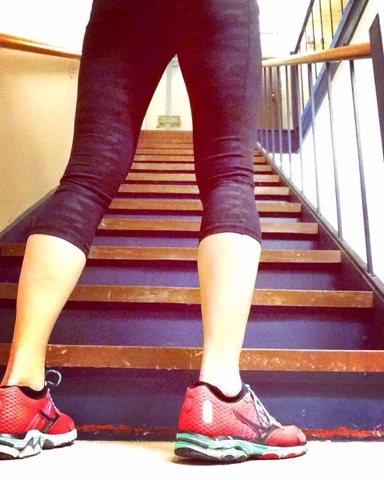 Anyways, this was only my second time (this season) working out on the stairways of this building (I routinely do stair-training in my home, though), and I was a little gun-shy after the week prior. I may have kinda/sorta overdid it by doing 16 sets of climbs (80 total flights of stairs) that first week. 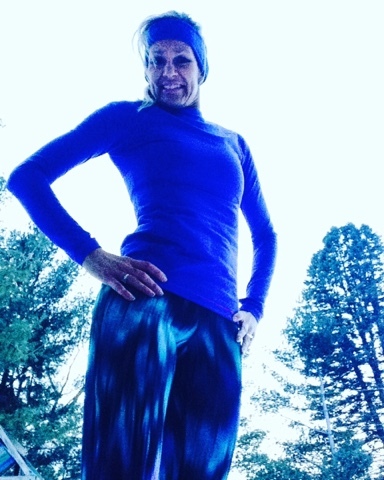 Even though I felt great, approximately 20 hours later, it was a different story when the dreaded DOMS hit me hard, and my calves were a painful, knotted-up mess. This past week, I did 12 sets (60 total flights). I still felt a good burn, and I was able to "run" most of these sets. 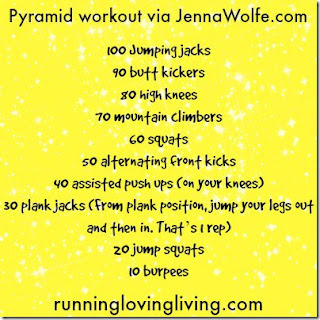 Later, I did a quick mile on the 'mill (#nevermissaMonday) and also a some-what intense cardio pyramid workout. All was good, and the DOMS were a no-show. 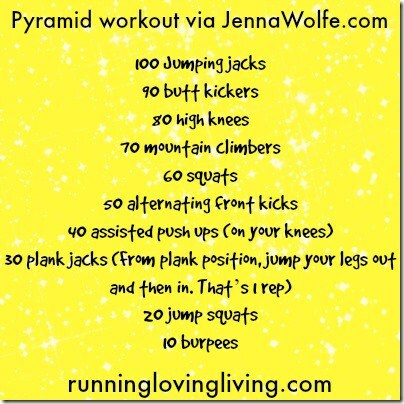 Want a quick "little" cardio challenge? Give this a whirl! Tuesdays have been my long-standing arm/shoulder/upper body day. This goes way back to my days of long ago, when I first started doing strength training via P90X. That old habit of "Tuesday arms,etc." has stuck, and I have the guns to show for it (#bang) (sorry, bad joke). Wednesday, the temps started to climb. When I got home form work, we were entertaining upper 30-degree temps, so I took it to the streets. Three miles later, I returned home feeling like the caged bird who had been set free. Cabin fever is not my thing, and I have logged more miles than I care to think about on the 'mill in recent weeks. 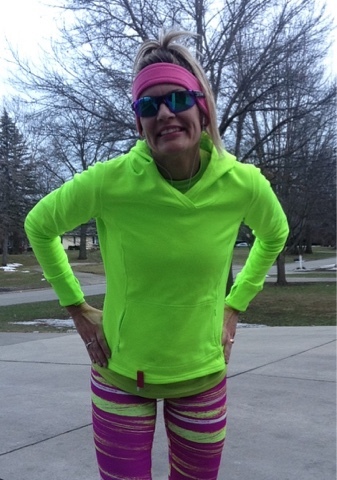 Thursday also had pleasant temps for Iowa in February, so I met up with my friend, Barb, after work and we did 4 miles at a decent tempo-ish pace. It has been so nice doing all these miles in the daylight! It really is the little things that make me smile. 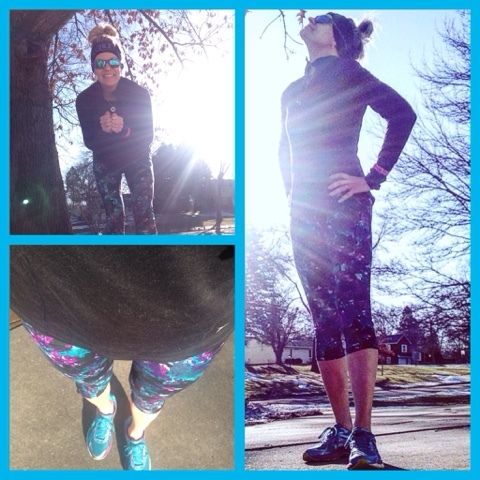 Finally, the weekend had me lacing up for back-to-back outdoor miles. 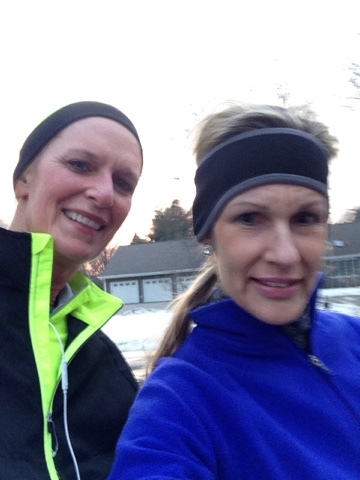 Saturday, Barb and I ran 6 miles in the early morning sunshine. 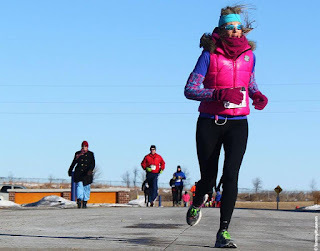 The temps were in the low 40's, and the wind was minimal. Most of the roads were clear and dry (from all the melted snow and slush). The sunshine on Saturday was glorious! 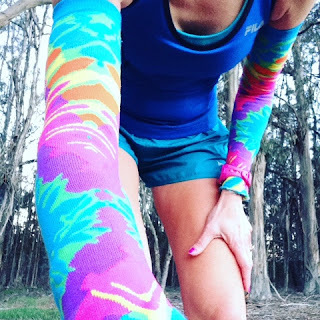 Sunday, I waited until late in the afternoon, and did a quick 2-miler, again at a near tempo pace...not sure what is happening with me running faster than normal (no complaints). Typically, I don't do back-to-back running days, but sometimes the weather just beckons me outside. My mileage is still pretty much at the minimum, but will be gradually increasing as I get ready for my spring races. 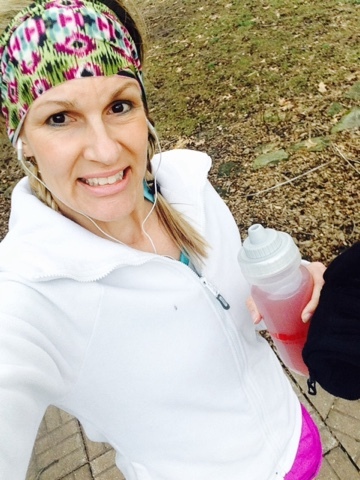 I could just jump right to 10-milers on the weekends, but this year I am committed to doing things gradually. After all, just because I can do certain things, doesn't necessarily mean that I should. 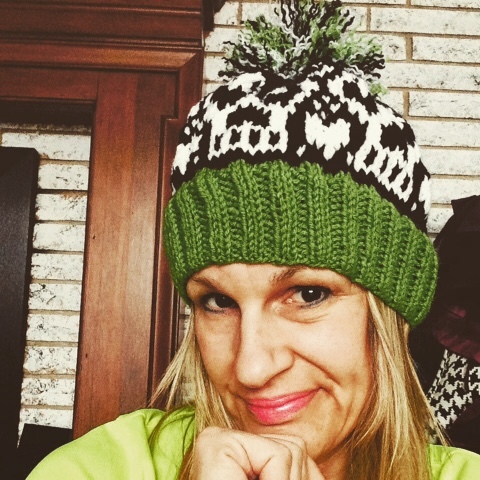 On a side note, another fun weekend project that I finished was my first-ever knitted hat! I have made numerous scarves and sweaters, but have never attempted a hat with double-pointed needles (and a somewhat complicated pattern). 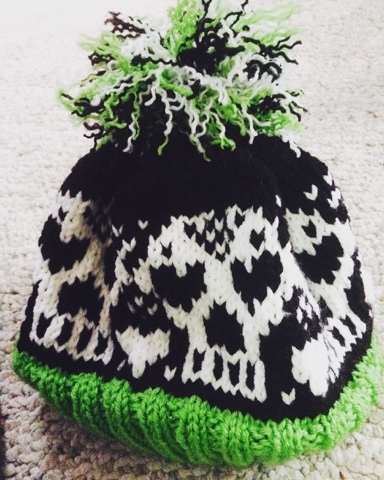 The color scheme was my idea (because I'm an #artgeek #colorfreak), and so was the funky pom-pom. Here's a closer look. I'm not really into skulls and such, but I thought the pattern was cool, and I'm always up for a challenge. 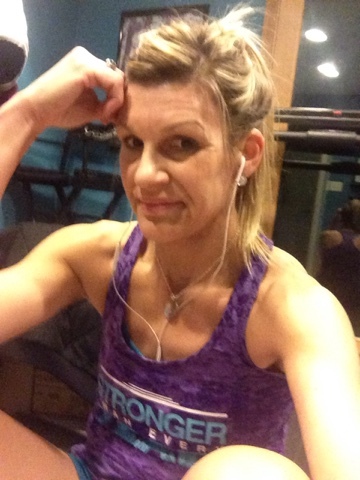 Were you consistent this week with your workouts? How was your weather? Have you ever created any wearable art from yarn? I'm linking up with the awesome Holly from HoHo Runs and Tricia from MissSippiPiddlin for the Weekly Wrap link-up. Do head over, and checkout what everyone's been up to. You're sure to get some great inspiration!! 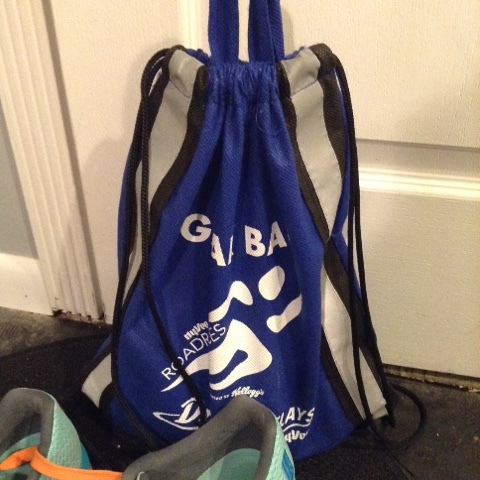 Do you have a race-day-go-to-bag? 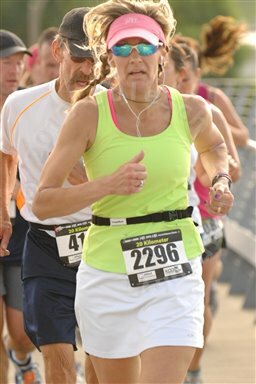 I have been running for almost 11 years, and have been racing (a lot) in the past years. 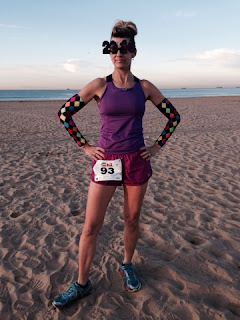 There have been many race-day mornings spent running around my house in a frantic last-minute search for my "stuff." 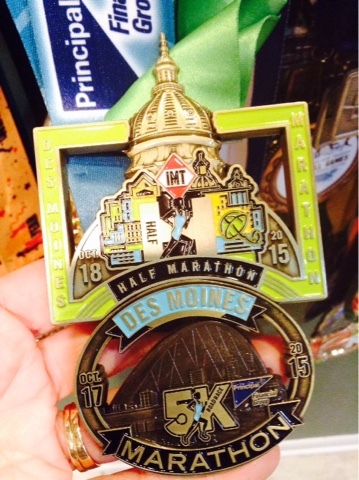 Living in small-town Iowa, most of my races are at least an hour's drive from my house. If you do the math, that means I have to set my alarm an hour earlier than a lot of the racers and don't have any extra time to be searching for what I may or may not need for the morning. More often than not, things would get forgotten or I'd get a late start hitting the road. Finally, it occurred to me that my system (or lack thereof) was not working. 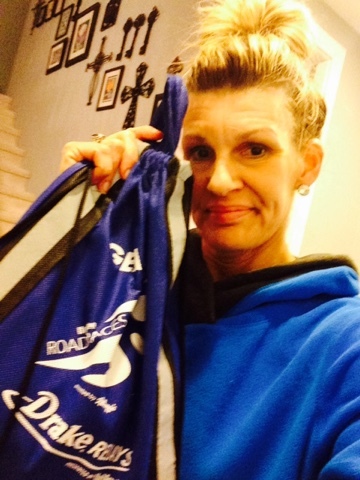 I also had an assortment of drawstring "swag" bags(from previous races (go figure) just begging for a purpose. 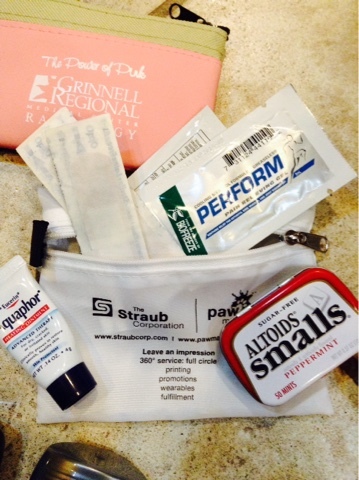 So, I made a list of all those race day necessities (and potential emergency or first-aid items), and came up with my very own Race Day Go-To Bag. 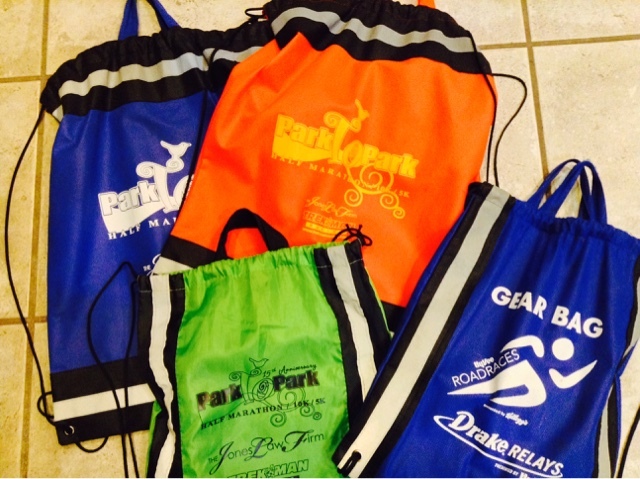 Why have a Race Day Go To Bag? These are small items that will easily get lost and buried, so I keep them in various small bags (usually acquired from expos)...things like bandages, Aquaphor, Biofreeze samples (also from expos), and mints. Not pictured are also lip balm and moleskin. 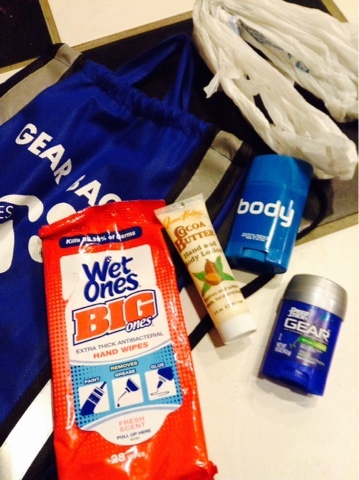 Then, there's medium-sized items that can hold their own...deodorant (travel size), Body Glide, diaper wipes. 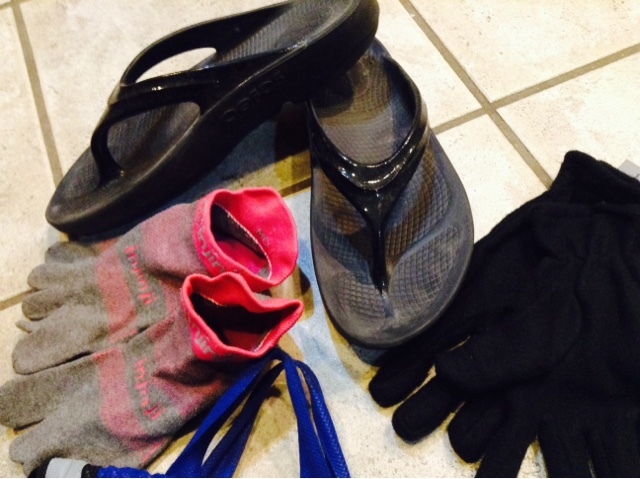 Finally, there's a few "large," last-minute items that I also throw in ..... a spare pair of socks to change into (in cold weather), flip flops (also to change into, but for warm weather), and gloves (keepers & throwaways). I'll usually toss in a fuel belt as well, because I don't always know if I'll be using/needing it until start time. Having a go-to bag (almost) always packed and ready has saved me a lot of frantic searching in the wee hours, especially when I'm already stressed about the commute and possible delays out of my control (traffic, parking, etc.). A lot of races have a bag drop area and typically the ones that don't will have parking close by; either way I'll have all this stuff available at or near the finish line. Also, using a draw-string bag makes it easy to carry my gear on my back. 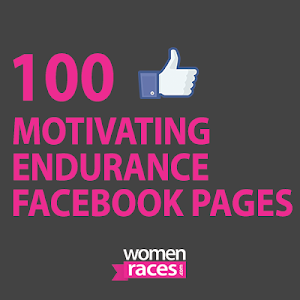 Do you have any race day strategies that help get you out the door? 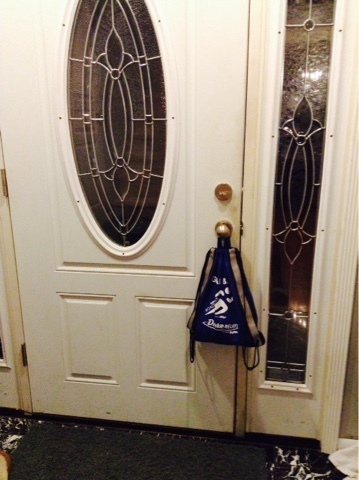 Have you ever used a go-to bag? 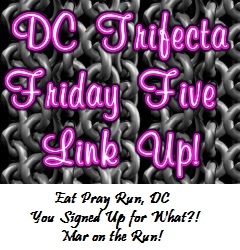 I'm linking up with the DC Trifecta gals ( Mar on the Run Eat Pray Run DC You Signed up for WHAT?) for the Friday Five. Go check it out...lots of favorites are being featured! So, What be the Haps?